Meet a silly and absurd cat who's like no cat you've ever met before, in this inventive and unusual book from the illustrator of the picture-book version of John Lennon's song "Imagine." 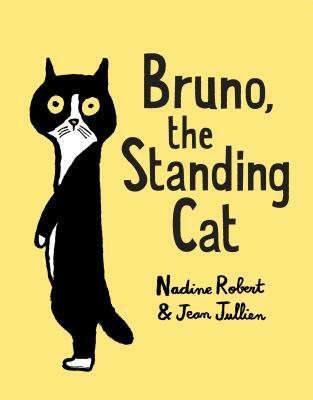 When a box arrives on Peter's doorstep, he opens it to find Bruno, a cat who is standing up on two legs. It is very odd. Bruno likes to chew bubble gum, play house, and skateboard--and refuses to engage in any catlike behavior. But Peter likes Bruno, and so they become friends and do everything they can think of together. Jean Jullien (illustrator of the picture-book version of John Lennon's song "Imagine") is an emerging picture-book creator who works in a signature thick black line and bold, flat color. His quirky, subversive humor is childlike at its core, and kids will delight in his light and irreverent approach. JEAN JULLIEN is a French graphic artist living in London. His practice ranges from illustration to photography, video, costumes, installations, books, posters, and clothing to create a coherent yet eclectic body of work. Visit him on the web at jeanjullien.com and on Instagram at @jean_jullien.